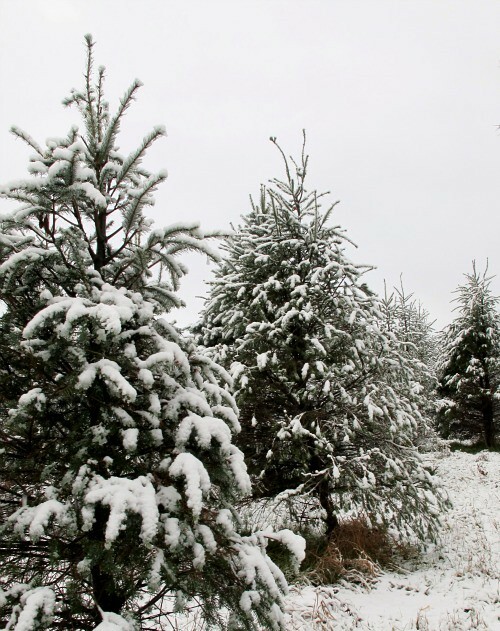 The first day of December arrived like an old friend wearing a white and fluffy winter coat. On went our own layers so that we could go out and explore the new icy world she had brought as a gift. The hush that comes when you first enter the land of just fallen snow invokes whispers and awe... and then of course the frolicking and squeals begin. Yet still, a blanket of peace remains the backdrop. 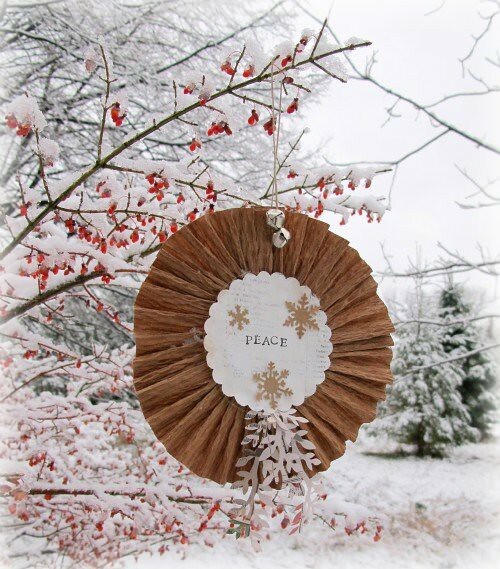 See this photo for how I gathered the brown tree paper for this winter ornament. Mid afternoon that December friend decided to show my family what winter used to mean...and she quietly turned off the electricity. As you know, it gets dark early. As the children tromped inside with snowy boots, I hustled to find more candles and stoke up the fire. Homework was done by the light of a flame. Our usual digital soundtrack was replaced by lots more piano playing than the usual nightly practice. Nut cracking reached new heights in popularity. We slowed down. We stayed close to one another by the fire and near the light of the candles. Our plans for latkes and a fancy Chanukah meal shifted to making quesadillas and lentil soup on the wood stove, which my son declared to be the tastiest ever. We lit our menorah, sang songs, and opened the first door of our count-down calendar. This night had potential for magic anyway, but now it will go down in our family's history as that special dark and quiet first night. When the lights, stereo and computers all blinked on simultaneously, there was a deep sense of loss mingled with the relief that our modern world had returned. I think I'd like to create more of these electric-free nights this winter. Might just be one of those activities behind a count-down door! How totally beautiful, and what a good idea to have a no electricity night behind and advent door! Beautiful post! Something kinda great happens when the power goes out... for awhile! Love this post, so beautifully written and photographed. Awesome. Now I'm wishing for snow, even though I'll be heading out to the hospital to have a baby sometime in the next 3 days. Oh.. so beautiful - we lived off grid for over two years and without electrical lights of any kind and it was truly wonderful. Oh I am jealous you have a beautiful blanket of snow already! Having once lived in Michigan many years ago, I remember many a wintry storm where we too lost our power. It slows life down to a simpler thought of survival togetherness. Oh so lovely and peaceful. Thank goodness for wood stoves, that's for sure. I could go for days without electricity, but then we have no water and that is a bit hard to bear. Happy Wintering. Isn't it such a gift of magic? We are still awaiting our first snowfall but after reading this, I will be sure to cherish that lovely stillness when the snow arrives. yes, ellen... the water thing. our well shuts off, too. Glad it's not just me who loves power cuts, it's lovely to have everything on a forced go slow once in a while! This was beautiful!! Loved it! A lovely post! My father used to turn off the power once in a while when my sister and I were little. It was wonderful fun. A little less fun when the power goes on a snowy day while the Christmas cake is in the oven, but only a little less. Joyful Hanukkah to you and your family. 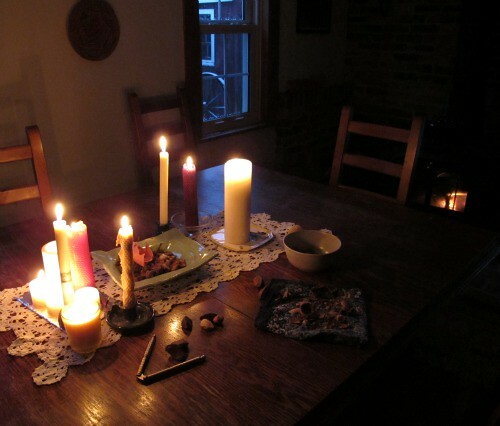 I kind of look forward to the occasional power outage (don't tell the gas&electric co.). Beautiful photos and beautifully written, I almost felt as if I was there for a minute or two. dark and quiet. some of the best parts of december. lovely post. pure white snow, peace and silence...i love your pictures, i love snow and all the magic that comes along with it~lucky you to have the wood stove around.. we would have snuggled all together and be covered with lots of fluffy blankets! Mother Nature usually turns our electricity off in the summer....but not quietly! It will be off for weeks when the big hurricanes hit! Not as nice as your cozy winter evening! b e a u t i f u l candles .. i kind of like when the electricity pops off..it is so quiet!! I love winter!Beautiful photos and beautifully written.